Tiffany Palmer, and her sisters Natalie and Hillary opened Fringe at 2622 East 29th Avenue, in the Rosauers Shopping complex a year ago. The Boutique, which offers clothing and accessories for women as well as home decor and gift items, recently expanded into the adjacent 1500 square foot space to double the size of both businesses. The Salon has added stations to accommodate 10 Hair Stylists, offering a full range of services and retail products. Popular Spokane hair stylist Roxy Zarowny has joined the Fringe Team. Roxy has owned and worked in Salons on the South Hill for 30+ years. Fringe is having a "Girls Night Out" preview of the Salon & Boutique this Thursday, April 21st from 4 to 8pm. For more information, visit www.fringesalonandboutique.com or call 509-315-8138. Peacock Virtual Solutions is a business owned by Laura Wilson that offers turnkey virtual administrative support to Spokane-area businesses. They allow you to focus on your business, while they handle administrative support needs from their office, instead of yours. They can answer your phones, provide data entry, scheduling, research, bookkeeping, pretty much anything to keep you organized. They also do spreadsheet creation and management, powerpoint presentations, word processing, correspondence, dictation, transcription, writing/proofreading/editing, travel arrangements, file organization, email inbox management. Computer and Technology Support is also one of their services. From cloud computing to virus removal, Peacock Virtual Solutions has experienced information technology Geeks on staff! They can solve your problems now or consult with you to design a brand new setup. Call 866-853-0398 or go to www.virtualpeacock.com for more details. The Rosauers store on 29th is the latest location to offer Victor Azar's line of organic hummus that is made right there in Spokane. The main and most plentiful ingredient in Victor's Hummus is organic Garbanzo Beans. They use organic ingredients whenever possible. And every batch is handcrafted and tasted before packaging to insure that you are getting the healthiest and highest quality product. Victor's Hummus comes in four flavors: Chocolate H'Mousse, a dessert full of protein, complex carbs, & Fiber, Fresh Basil Hummus, Jalapeno Hummus, Toasted Sesame. Come join Josh Wade, owner of the new Nectar Tasting Room and publisher of Spokane Wine Magazine, as he walks LaunchPad members through the steps of planting a healthy vineyard of social media vines. Wade's Planting the Seeds for Social Media Success will walk you through the intricacies of optimizing group buying sites, Geo tagging, QR Codes, and search engines. The event will take place on April 19th from 12pm to 1:30pm at LaunchPad's Training and Coworking Center, 120 North Stevens and will cost $39 to attend. Don't miss this great opportunity to pick up the essential tools you'll need to compete in an online market. For more information go to launchpadinw.com. It's raining rouge and tampons! Rainmaker Marketing announces that the recipient of their quarterly $1000 design and marketing contribution is going to local nonprofit Project Beauty Share. Julie Farley, owner and operator of the Makeup Studio created Project Beauty Share to help women in need feel more confident by providing them with safe, hygienic makeup, and other personal necessities that aren't provided at the state level. Of all the things you can buy with food stamps, you can't buy toilet paper and feminine hygiene products. Rainmaker Creative Director, Billie Gaura said they've had lots of nominations for this organization for more than a year. Many people have taken the time to ask for Rainmaker's help for Farley's incredible brainchild on the Rainmaker Facebook Page. Some of the area's other marketers, including Ed Clark, Deena Caruso of Finder's Keepers, bill Kalivas of LaunchPad INW and Margaret Croom of Nosey Parker have gotten behind this nomination too. Project Beauty Share will receive $1,000 in services from Rainmaker including design, marketing and some of the other 'umbrella' services they offer. Rainmaker Marketing's website is www.spokanerainmaker.com and they are also on facebook under Rainmaker Marketing. Columbia Medical Associates (CMA), a group of more than 50 primary care providers with 75,000 patients in the Spokane region, has signed a letter of intent with Group Health Physicians and Group Health Cooperative to be acquired as a separate but aligned entity. "The physicians of CMA have always been leaders in primary care and believe strongly in the development of an integrated delivery system in the Spokane area," said Jeffrey Markin, MD, president of the CMA Board of Directors. "Group Health shares the same values and vision and has demonstrated success with its patient-centered, medical home model of care. Our alignment with Group Health allows us to build on those successes by leveraging Group Health's many resources to develop a comprehensive system of care with primary care physicians at the core." Under the agreement, CMA will continue employing its non-physician staff, and its doctors will continue seeing patients who have insurance other than Group Health at their current locations. CMA doctors will join Group Health Physicians and CMA will operate as a separate entity within the Group Health enterprise. Columbia's website is www.columbiamedicalassociates.com. Merlyn's, at 19 West Main, will again be participating in the national Free Comic Book Day, Saturday and Sunday, May 7th and 8th starting at 10am both days. Anyone who comes in to Merlyn's can get 2 free comics from their wide selection of FCBD comics. They will also have free sketches for kids from 11am to 2pm both days and a visit by Star Wars characters from 1 to 3 each day. There will also be a costume contest with gift certificate prizes for the best kid ($20), male ($50) and female ($50). Come in, get your picture taken, leave your contact info and they will contact the winners. And as a special extra, they will post all the pictures and let their facebook friends help judge the contests. Here is the FCBD...website with a list of the books. www.freecomicbookday.com. Merlyn's website is www.merlyns.biz. During his teenage years, Peter Thomas created "actual size" dinosaur replicas using cardboard, packing tape and newspaper. These life-size sculptures include the Velociraptor and Tyrannosaurus Rex, among others. Peter took his passion for building dinosaurs and turned it into a marketable product. The first Recyclosaur, a punch-out cardboard Tyrannosaur model will debut at Whiz Kids in RiverPark Square this Saturday, April 23 and is truly a locally made product. The Recyclosaur is a 28" x 12" T-Rex model made entirely of recycled and recyclable corrugated cardboard, made by a local company, Sonderen Packaging, who also supplies the recycled corrugated cardboard. The Recyclosaur was photographed at the Dean Davis Studio, and the product packaging was designed by local graphic design veteran Mike Emenegger. Johnston Printing was responsible for printing and finish work done at Inland Bindery. 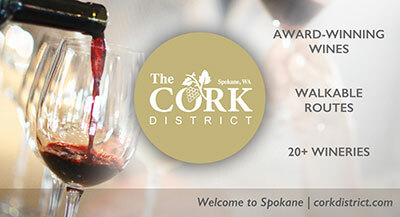 Next Thursday, April 28, from 5:30 to 9pm, "Uncorked", presented by The National Association of Women Business Owners (NAWBO) will be held at Nectar Tasting Room, at the corner of Stevens & Main Street in downtown Spokane. 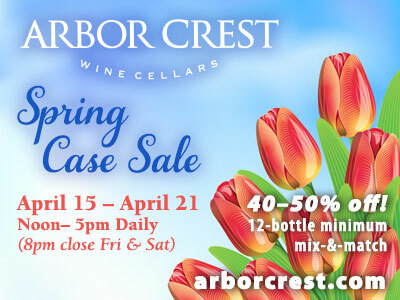 Enjoy an evening of wine tasting and appetizers. John Allen from VINO! will be on hand lending his expertise to the event. Proceeds from this event directly benefit women business owners in our community. Advance tickets are $38 ($42 at the door). RSVP and pay by credit card online at www.nawbonw.org, or call 509-731-3309. Payment at the door is cash or check only. The Spokane Regional Marketing and Communications Association (Spokane MarCom) presents the 16th Annual Spark Awards on Thursday, April 21st, 6pm, at The Lincoln Center, recognizing the best and brightest achievements of the local marketing and communications community. Tickets include dinner and are $45 for MarCom and PRSA members, $50 for non-members and $20 for students with valid ID. Proceeds from the Spark Awards fund internships for area college students seeking careers in marketing, communications or related fields. For more information, please contact Leslie Czernik at 509-241-4756. Register for the event at www.SpokaneMarCom.com/rsvp by today, April 18th. One of Spokane's largest commercial printers, National Color Graphics, recently obtained a 6 color Komori printing press, which makes this one of the newest state of the art presses in the area. This press features inline aqueous coating and true closed loop color reading for color accuracy. This is the second 6 color Komori press for National Color in the past two years. This new press allows for higher quality printing with faster turn around time. National Color Graphics has been operating in Spokane for over 40 years. For more information on National Color Graphics, call Chris Knobel at 509-326-6464. Rex Anderson has been hired by ALSC Architects as a project architect. He is a licensed architect in Washington and a LEED Accredited Professional. Anderson holds a bachelor's and master's degrees in architecture from the University of Idaho. The Spokane City Forum luncheon is this Wednesday, April 20 from 11:45am to 1pm. Gonzaga University Education Professor John Traynor, will discuss "Our Kids...Our Business - Priority Spokane Education Initiative." Location is Spokane First Presbyterian Church, 318 S. Cedar St. $10 general admission, $5 for students, lunch included. Child care available by reservation for $4 per child. For more information, call 509-777-1555. Reservations are due by noon today. The total spending for online ads last year reached an all-time high of $26 billion and for the first time surpassed newspapers, which had $22.8 billion, according to a report from the Interactive Advertising Bureau and PricewaterhouseCoopers. Web ad revenue increased 15%, and the platform is ranked behind TV, which tallied $68.7 billion, as the top ad medium. In today's troubled times, hope can often be in short supply for many people. But organizers of the Zak! Charity Open are determined to bring the magic of hope to children in the Inland Northwest by raising money for two local children's charities. In the 12 years since it was first started, the Zak! Charity Open has become one of Spokane's premier charity events, raising more than $2.5 million for local children's charities. The 2011 event will include a Beat the Pros poker tournament on Saturday, July 23 at Northern Quest Resort & Casino followed by the always-popular dinner and auction on July 24 at Northern Quest. Once again this year, the Zak! Charity Open will feature two separate golf tournaments on July 25 - one at Spokane Country Club and the other at Manito Golf & Country Club. Proceeds from the three-day event will benefit the Rypien Foundation and Boys & Girls Clubs of Spokane County. The Rypien Foundation was founded by Super Bowl MVP Mark Rypien, who lost his three year old son, Andrew, to cancer. The Rypien Foundation helps provide children who are battling cancer and their families with the support and services they need during their most difficult times. Part of a nationwide effort, Boys & Girls Clubs of Spokane County provides kids in our community with a safe place where they can develop the skills and knowledge they'll need to reach their potential. For more information about the Zak! Charity Open, visit www.zakcharityopen.org, or call 509-244-8656. "Being placed on hold can be tough, but if you put on your speaker phone you can dance to the music until you get what you are waiting for."